In 2018, Ole Miss boasted the No. 9 total offense in college football, averaging more than 500 yards per game with Phil Longo calling the plays. But with Longo’s move to the University of North Carolina, new offensive coordinator Rich Rodriguez will be tasked with maintaining the Rebels’ high-powered attack in the fall. Rodriguez, a West Virginia native, brings more than 30 years of coaching experience to Oxford. 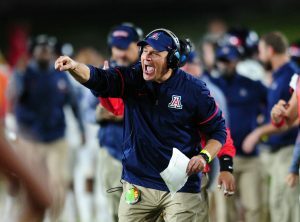 He most recently served as the head coach at the University of Arizona, where he spent six seasons. In 2014, Rodriguez led the Wildcats to what was only their second 10-win season in school history and was recognized as the Pac-12 Coach of the Year. During the 2017-18 season, Rodriguez was the center of a three-month internal investigation conducted by Arizona, in which he was accused of sexually harassing an administrative assistant and creating a hostile work environment for years. He was fired as the Wildcats head coach on Jan. 2, 2018. Prior to his tenure at Arizona, Rodriguez was the head coach at West Virginia University, his alma mater, where he saw great success. In 2005, Rodriguez was named Big East Coach of the Year after the West Virginia Mountaineers defeated the Georgia Bulldogs in the Sugar Bowl and finished No. 5 in the final AP poll. Rodriguez followed up the 2005 season with another 10-win season and a Gator Bowl victory over Georgia Tech. He continued his success at West Virginia until 2007, when he left the team prior to the Fiesta Bowl to take the job as head coach at the University of Michigan. However, accepting the head coaching job at Michigan wasn’t a smooth transition for Rodriguez. In 2007, West Virginia filed a motion in court to find that Rodriguez had breached his contract, a contract he had negotiated just four months prior. The contract included a $4 million buyout which would be due to West Virginia if Rodriguez left the university within one year of renegotiating his contract. The two sides would settle the case in 2008 with West Virginia paying out $2.5 million to Michigan and Rodriguez paying the school the remaining $1.5 million. As the head coach at Michigan, Rodriguez posted a 15-22 record in three years on the job. His .405 winning percentage is the lowest of any Wolverine head coach and includes a 2-7 record against rivals Ohio State, Michigan State and Notre Dame. After spending most of his coaching career as the head coach, Rodriguez will be transitioning to a backseat role as coordinator. With Jordan Ta’amu’s departure, quarterback Matt Corral will be taking the reins of the offense next season. Developing a relationship with Rodriguez will be imperative for Corral going forward to maximize Ole Miss’ talented offensive weapons.